Land’s End is where it all begins. The John O’Groats walkers start here, and look forward to a finish three months later. It’s a life I suppose. But they are right in one thing: don’t hang around. Land’s End is a tourist attraction, not a place to linger in sentimental memory of a nation’s departure to the sea. With ‘sunny’ pictures on the weather map before I left, the last thing I threw in my sack was my Tilley hat. A good move too: I was grateful for sun tan cream from the shop in Sennen Cove. This is good coastline, with Cape Cornwall just beyond Sennen Cove the first of many promontories. Along the coastal path, there are remarkable reminders of Cornwall’s tin trade – much of the district is now a World Heritage site because of the mining heritage. However, the walking was not as rough as I feared; indeed a stretch around Morvah got to be a bit of a drag, but there is a very long stepped climb up to the lane at Zennor which made a long day even longer. Day two was quite remarkable, a magnificent and varied walk. Zennor past the Carracks to St Ives must be as good as coastal walking gets, with some genuine tough stuff, especially early on, a great feeling of remoteness and the occasional route finding problem. I remember one path alternative which had a spider’s web a few yards along – a good indication no-one had been that way for some time, so probably not a National Trail. And then there is the turn to see St Ives. I had always scoffed at the artists’ claim of ‘special light’ in St Ives; no more. The town hung like a trompe-l’oeil, a hyper-real piece of art, a dare to digital rendering, quite beyond the wit of 4Mb of cheap Olympus to reproduce. 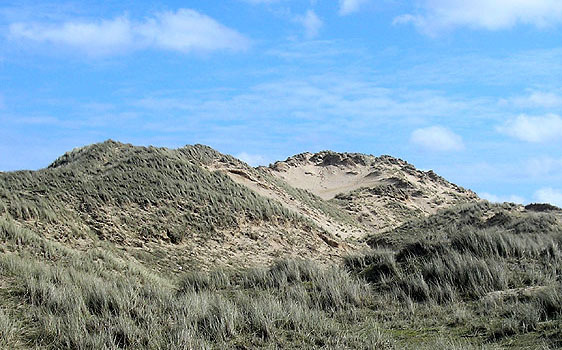 Lelant to Hayle is dull stuff, it’s true, but I greatly enjoyed the dunes through to Gwithian Towans; a different kind of remoteness, despite occasional caravan camps, and surely better than a military trudge along the beach. The last of the three days dawned hazy, lending the beach at the Towans an ethereal air. I took the shortcut over the Red River that saves you going up to the road, and my first break was at the cafe above Hell’s Mouth – good name, deserves it. 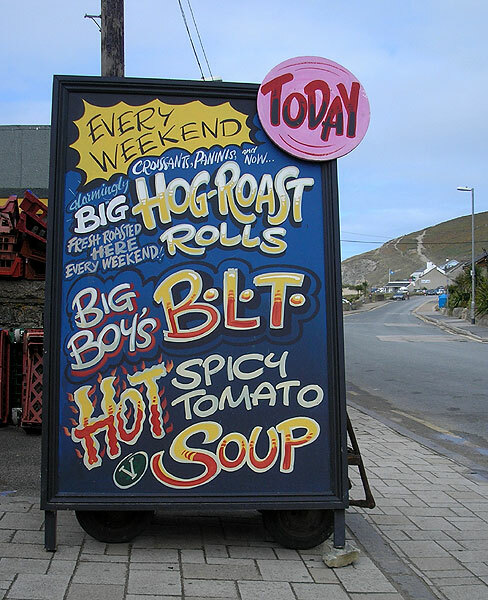 Portreath was a bit of a dump, and I left it in a light shower, but things improved (weather and scenery, helped by food) after Porthtowan. Trevaunance Cove was heaving with a board surfing championships, but barely no-one sat in the pub’s outdoor area, so I had (more) time to myself before climbing up to the bus stop, Truro, and the sleeper train followed by a day’s work in the office. Three minutes in and it’s chat of the day, with a 60-something surf coach and ‘beachologist’: he told me how he had shown that Pharoah Rameses II once voyaged here to create Gull Rock as an experiment with the pyramidal design. Sometimes you just have to move on. Perranporth was not quite as enticing as I thought it might have been, but the Perran beach took me swiftly north to dunes around Holywell. 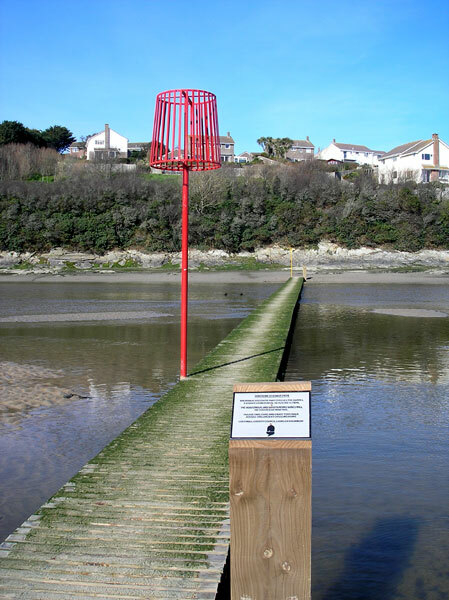 The River Gannel bars the way to Newquay, but low tide meant I could take the Crantock boardwalk. However the deviations thereafter, to Pentire Point East and Towan Head, make Newquay an awful long time coming, and you have to wonder whether it’s worth it. 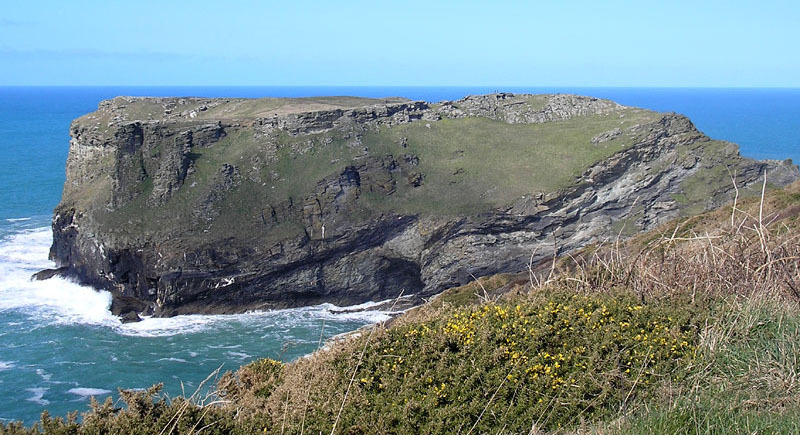 Thankfully the next day’s start, from Watergate Bay to Mawgan Porth, is of good quality, and there’s a long wild stretch around Bedruthan Steps – look out for the grassy top of Diggory’s Island – to a pretty cove at Porth Mear. 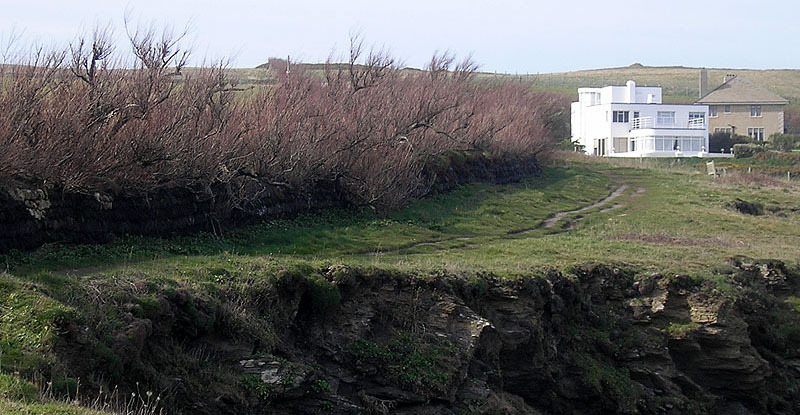 Beyond Porthcothan the cliffs decline, with holiday developments peppered around, but it’s worth noting the tamarisk-topped drystone walls around Trevose Head. At Stepper Point, it was heart-breaking not to see Padstow down the Camel estuary; however, when you reach it, it’s a far better town than Newquay, even if the personal property of superchef Rick Stein. I had been keen to make Padstow, so that any possible delays waiting for the ferry to Rock did not scupper my next day. After a quick look round the town, I was straight on to the ferry, and stepping off at Rock, a little back pain that had troubled me for two nights and a day disappeared. 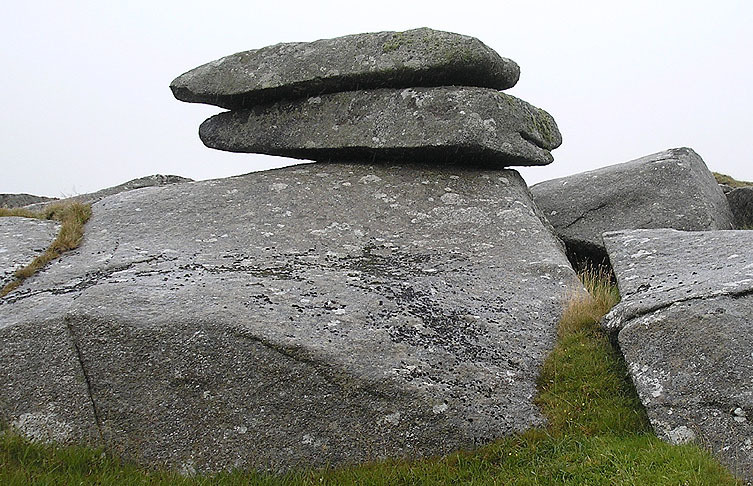 I was soon at Pentire Point, which brought the first views of Bodmin Moor. The quality continued: the hill fort on the Rumps, the magnificent Lundy Hole, the little inlet of Port Quin, and finally pretty Port Isaac. This is an excellent stretch of coast, and it made for a great day. 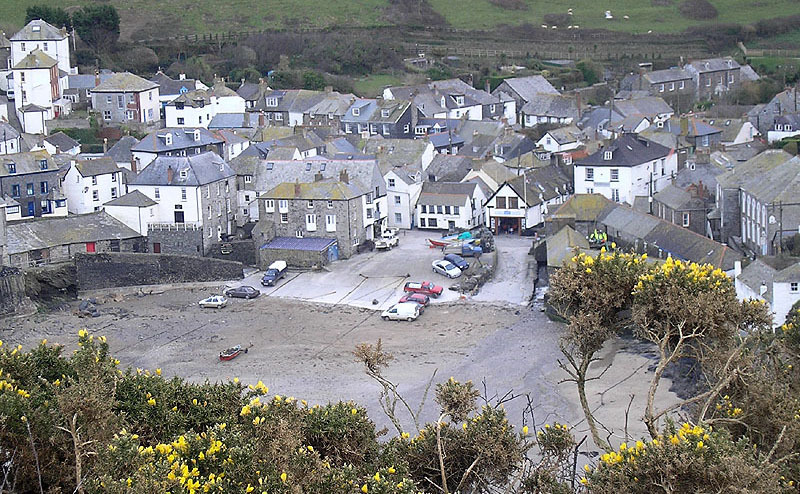 The guide books give Port Isaac to Tintagel a ‘severe’ rating. Well it’s a good walk but hardly a back breaker. Hartland to Bude has twice the 2000 ft height gain, and Zennor to St Ives a far greater feel of remoteness. Here, there is arable farming alongside at the start and later a number of escape routes inland, all well-marked. Some of those inland valleys, though – like that leading to Tregragon – are fine wild and deep, and would be well worth exploring one day. I had time for a pint at Trebarwith Strand before turning aside from the sea at Tintagel Head, legendary landing place of Tristan, for the tat shops of Tintagel itself and, next year, the moors. 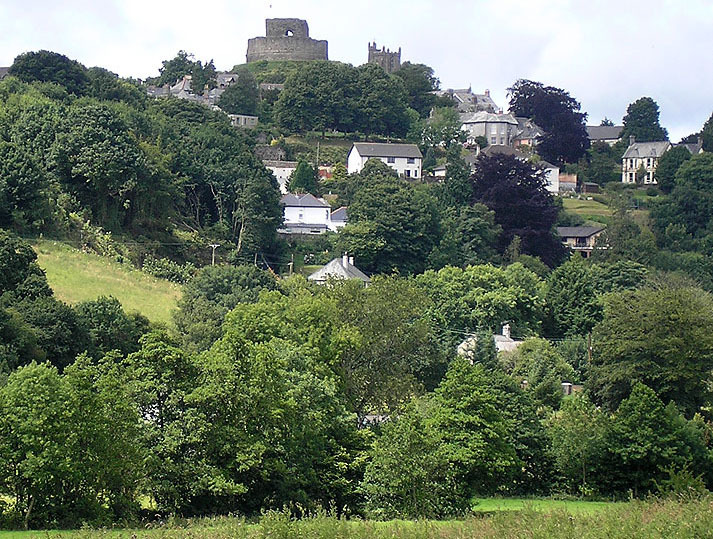 The prime task of these three days was to cross Bodmin Moor at its highest point, with Camelford as the jumping-off point; but first, a short afternoon from Tintagel. Condolden Barrow, at nearly 1,000 feet, is the local high point, but en route lay a herd of inquisitive bullocks. 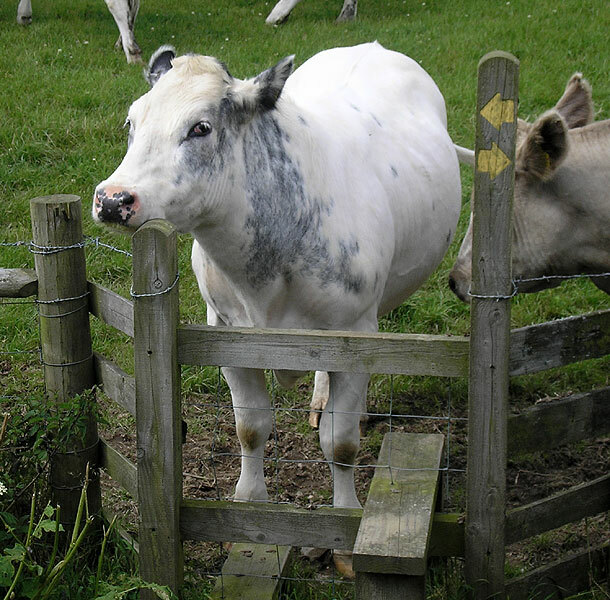 I made for a stile, made faces at them, fifteen minutes later worked out that it was the wrong stile, but I live still. Descending from the barrow was a pain, alongside a busy vergeless B road much of the way. Day two, and I woke to rain outside the window. Clearly, this was to be a damp moor. But I like these. 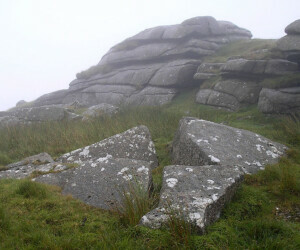 Roughtor is a fun rocky top, and Brown Willy the high point of Cornwall, but neither was a challenge with a clear tourist path from the road end. My route beyond was trackless, and I was heedful of the warning sign: ‘Beware quaking bogs’. In fact, my route was for the most part surprising firm, and despite visibility down to 100m, navigation was not too tricky across Buttern Hill and Bray Down, both littered with ancient cairns. 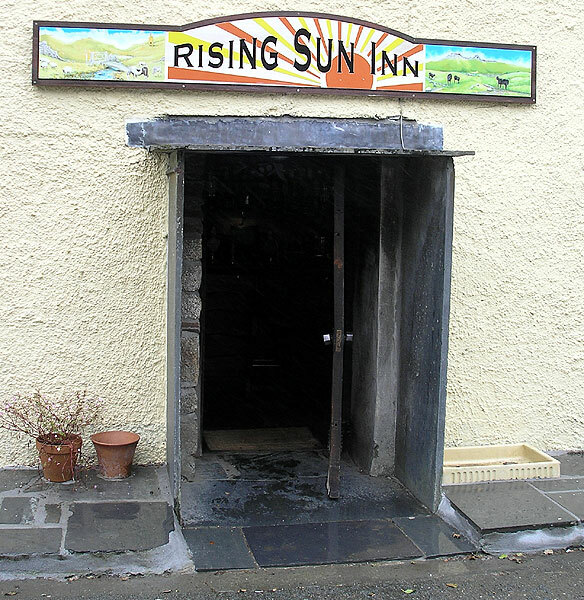 Then there is a wonderful isloated pub just off the moor, the Rising Sun, which had the decency to serve hot oxtail broth in the middle of July! 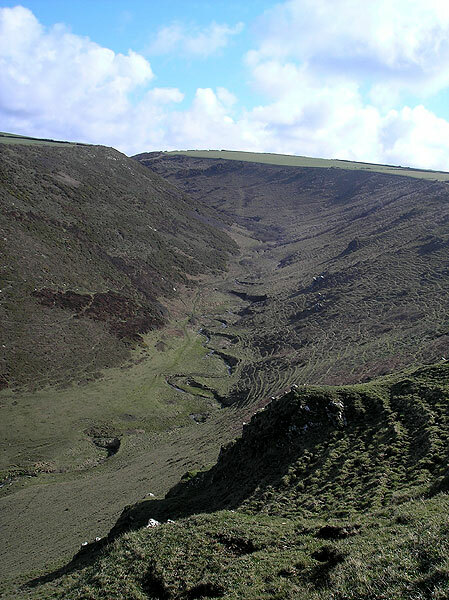 Beyond, it’s lowland walking, much on the Inny Valleys Walk (notorious for its wall stiles), before drying out on fast lane walking beyond Pipers’ Pool and past the Kestle Rings iron age hill fort. The rain just about stopped overnight. This was to be a brisk walk sandwiched between bus trips, not quite leisurely but good progress made. That meant no chance to stop in Launceston, where I picked up the Two Castles Trail, which I was to follow all the way to Dartmoor. Devon is entered at, of course, the Tamar. 2006: The Tinner’s Arms at Zennor is a great Cornish pub. 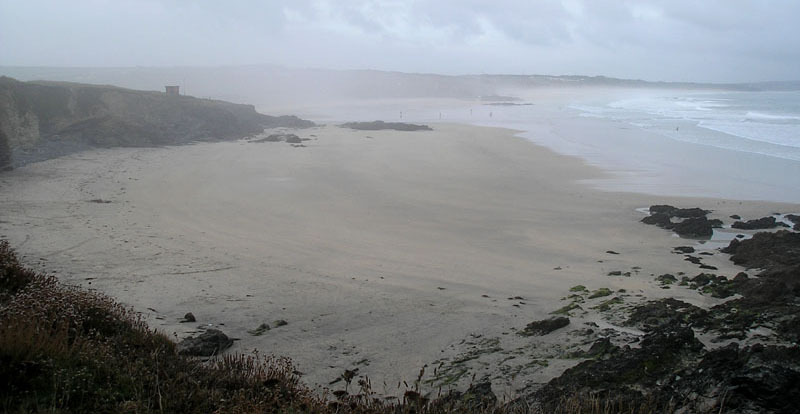 On Gwithian Towans – what a find. The Martins made me feel very welcome, blagged me a place at the local restaurant which I could not have achieved otherwise, and their Scots friends also down for the weekend were best friends with legendary West Ham penalty king Ray ‘Tonka’ Stewart! 2007: De Wolf GH in Newquay (probably not bad for Newquay), Well Parc Inn Trevone (70s time warp), Anchorage GH in Port Isaac (good). 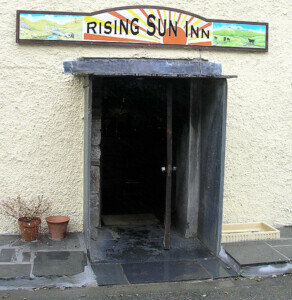 2008: Both nights at the Countryman Hotel in Camelford, courtesy of the Camelford-to-Launceston bus service; a popular walkers’ hotel.